Auction # 1911 WORLDWIDE + ARGENTINA: General March auction! 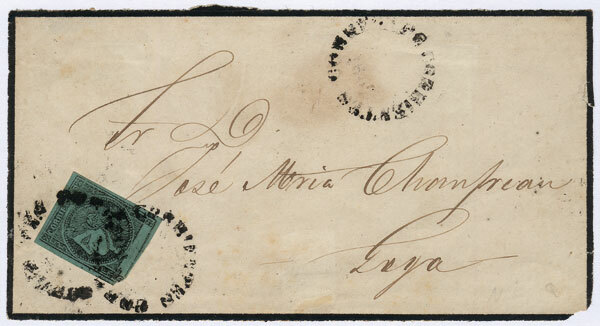 GJ.5, 1865 blue-green, type 8, franking a front of mourning cover sent to Goya, with THREE STRIKES of rimless datestamp of Corrientes (2 on the stamp), spectacular and rare! Lot 88 - Argentina corrientes - Guillermo Jalil - Philatino Auction # 1911 WORLDWIDE + ARGENTINA: General March auction! Lot 91 - Argentina corrientes - Guillermo Jalil - Philatino Auction # 1911 WORLDWIDE + ARGENTINA: General March auction! Lot 339 - Argentina other items - Guillermo Jalil - Philatino Auction # 1911 WORLDWIDE + ARGENTINA: General March auction! Lot 338 - Argentina other items - Guillermo Jalil - Philatino Auction # 1911 WORLDWIDE + ARGENTINA: General March auction!